I recently bought a French colouring book, when I visited France a few months ago. 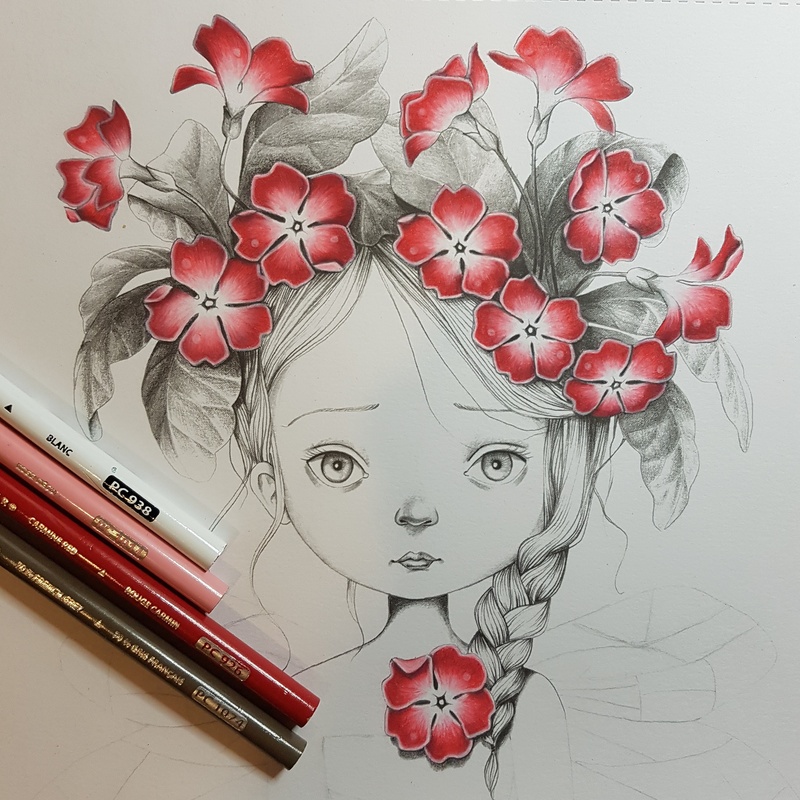 Coloriage Wild is by French artist and illustrator Emmanuelle Colin. 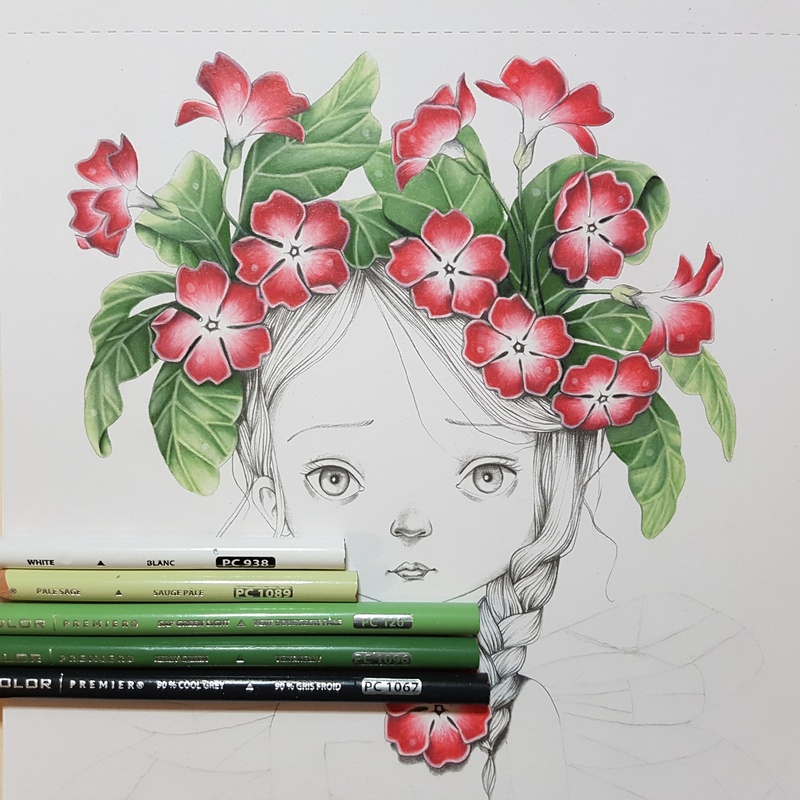 Her beautiful artwork has been used in storybooks, games, paper dolls, stickers and more. 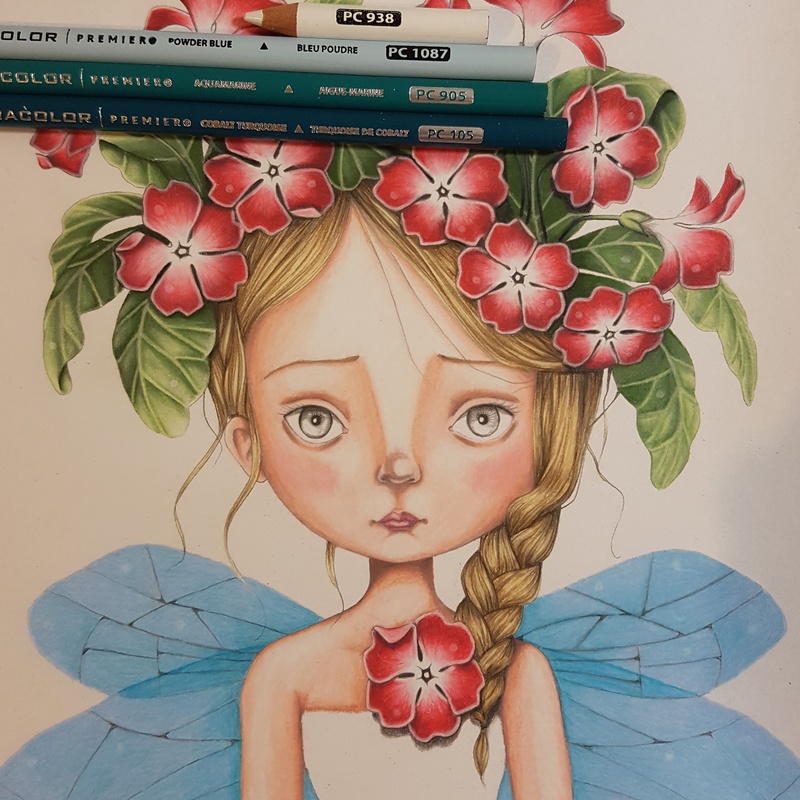 I will be reviewing her book next, but first I wanted to share my first picture that I coloured. When I first looked at this book I didn’t know where to start. The line drawings are so beautiful and delicate and styled more like grey scale, which I had never coloured before. So I thought I would see what kind of art Emmanuelle does and which kind of colours she uses for her flower girls. I decided to go with the flower girl with similar flowers to the top left-hand picture and make her a fairy as well. So I first sketched in her wings and body. I had to take my time and measure out the wing span and lines. Next, I coloured the flowers a similar colour to the picture. The flowers probably took me the longest out of all the elements in this picture. I was using Prismacolor pencils, which layered really nicely on this paper. Next I coloured the leaves. This was challenging given that they greyscale. I had to be careful not to go in too heavy so that I could still see the shading underneath and shade with the pencils where needed. The hair was probably the easiest and quickest to colour in this picture. The grey scale lines really help to give the impression of real hair. For the skin I wanted a similar pinky-purplish complexion to the picture. I found the grey scale shading on the nose and eyes a bit difficult to cover, but it also made it easier to give that depth. At this point I wasn’t happy with the body, but I did go back later and alter the shading. She kind looks back the front at this point. I struggled to find a colour combination that matched the picture, but I am happy enough how these colours turned out. I wanted the wings to translucent, which didn’t really look apparent until I added the overlap. I used a lead pencil to put in the darker lines, which didn’t smudge like a pencil would have. Last step was the dress and the eyes. I decided to use quite understated colours for these elements so the flowers and wings were the primary feature. The eyes were quite easy to colour since most of the shading and lines were already done and I just had to go over with pencil. I did question whether I should do a background at this point but I thought it was better to leave this one. So here you have my beautiful little flower fairy. I am so happy with how she turned out and may even frame her for my daughter. When Octavia saw the picture, she said ‘oh beautiful mummy’. I am now feeling really excited to start colouring the rest of this book. Since I only used Prismacolor pencils in this picture I have plans to a few other mediums to see how they react to this book. So stay tuned for a review and more finished pictures from Coloriage Wild. Beautiful! It inspires me to maybe pick up some coloring books!